The SeeHorse wearable monitor allows owners to track their horse’s health on a smart device. A new wearable device for horses will send an email to their owner of veterinarian when the equine is not feeling well. Similar to the wrist bands or gym fitness straps that people use, the Canadian developed SeeHorse wearable collects a horse’s vital signs and sends that information to a smart phone or other device, alerting owners, veterinarians or others when something is not quite right. SeeHorse fitted to a horse’s bridle. SeeHorse tracks a horse’s temperature, pulse, and respiratory (TPR) functions and builds in-depth daily and long-term reports and analysis of the animal’s activity. This helps owners and others working with horses keep a close eye on their health and fitness levels, as well as managing conditioning and preparation for competitions. “This wearable gives a horse a tool to connect with humans like never before,” says Peter Mankowski, SeeHorse co-founder and CEO. Owners can track their horses on a smart device. “We saw a horse’s temperature spike and then drop unexpectedly and it took only seconds to notify the owner, the veterinarian and others about the event. Thankfully, it was not an emergency but simply the case of horse having early pregnancy signs,” Mankowski said. In addition to being what Mankowski calls a 24/7 “coach-veterinary tool”, the waterproof device that can be used almost anywhere on a horse with special straps or bands will recharge its own battery through the horse’s movements. 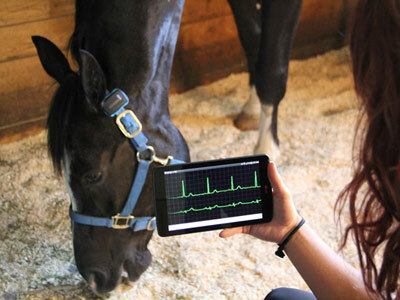 SeeHorse wearable collects a horse’s vital signs and sends that information to a smart phone or other device. “A moving horse is a natural source of clean energy and we’ve designed the SeeHorse unit to be clever enough to take advantage of that,” he says, adding this gives SeeHorse a zero pollution footprint. It was co-founder Jessica Roberts, an avid rider and horse lover, who convinced former BlackBerry research and development lead Mankowski to channel his love of animal science and technology into developing a device that could help horse owners do a better job to taking care of their animals and preparing them for important events. And it was executives at Waterloo Region’s Communitech Hub that convinced him to keep his start-up in the area; the industry-led innovation centre provides office space, resources and mentorship, coaching and industry contacts to emerging tech companies. SeeHorse has also received support from other sources, including the Ontario Equestrian Federation, the Accelerator Centre JumpStart program funded by FedDev Ontario, Ontario Centres of Excellence, and the Stronach Group. The SeeHorse wearable is available online at seehorse.ca, with the goal of being in full-scale commercial production within 12 months. Longer term, Mankowski says he’s promised Roberts to help sponsor equestrian events throughout Canada as a way of giving back to the equine community. Mankowski has ideas for other agricultural devices too, such as for the dairy and beef industries, but for the time being, his focus is on successfully launching SeeHorse into the marketplace.